this air hangs like a dead hand. which once were open to all. are filled with the moaning of many winds. I have not been to Glencoe for a few years, but even just driving through I am always struck by the atmosphere of the place, even on a bright sunny day. In how many places like this, all over the globe, have the 'King's men' left their mark? 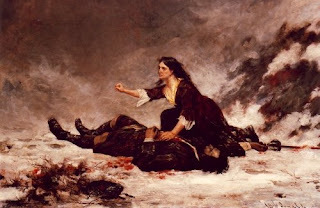 The painting is by John Blake McDonald c1879, held by the Royal Scottish Academy. I tried to leave a comment before but fell foul of lost passwords. How much worse is the betrayal when your fellow man is invited into your home as a guest; then breaks age old traditions that bind communities, helping the harsh life they all experienced.